The Panthers are releasing Munnerlyn, Ian Rapoport of NFL Network reports. Munnerlyn finished the 2018 regular season with 47 tackles (38 solo), two sacks, one fumble recovery and one interception on nine passes defended in 16 games played. Analysis: Munnerlyn played his first full campaign since 2015, starting five contests along the way. After just 29 stops last season, the veteran was closer to his career average of just over 50 this time around. Additionally, James Bradberry was the only Panther that topped his nine pass breakups. With two years remaining on his contract, he'll aim to keep his nickel position in 2019. Munnerlyn (knee) was a full participant in Thursday's practice. Analysis: Munnerlyn was held out of Wednesday's practice due to a knee issue, but he now appears to have made a full recovery. The 30-year-old rotational cornerback thus appears on track to suit up against the Falcons on Sunday. 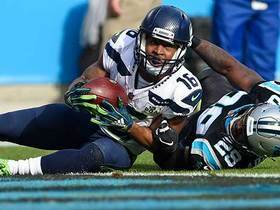 Munnerlyn (knee) did not practice Wednesday, Steve Reed of the Associated Press reports. 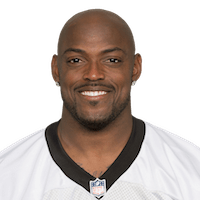 Analysis: Munnerlyn appears to have suffered a knee injury during Monday's loss to the Saints, and sat out the Panthers' first practice of the week. If the 10-year veteran is unable to get healthy in time for Sunday's tilt against the Falcons, expect Lorenzo Doss to see a slight uptick in snaps. 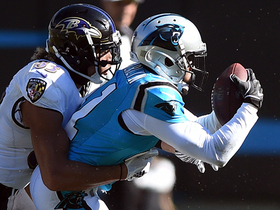 Munnerlyn recorded two solo tackles and a sack in Sunday's 26-20 loss to the Browns. Analysis: Munnerlyn played 60 percent of Carolina's defensive snaps and managed to bring down Baker Mayfield for the team's only sack of the day. The 10-year veteran has 41 tackles and an interception this season, and he'll look to slow down Drew Brees in an NFC South clash on Sunday. Munnerlyn (chest) finished with eight tackles (four solo) and half a sack in Week 9's win over the Buccaneers. 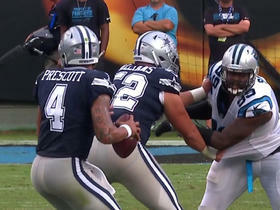 Analysis: Munnerlyn tied teammate Thomas Davis to lead the Panthers in total tackles. Thanks to that season high, he now sports 24 stops to go with one interception through eight games. Seattle Seahawks quarterback Russell Wilson finds wide receiver Tyler Lockett in opposing territory, as he gets into the red zone on a 43-yard completion. 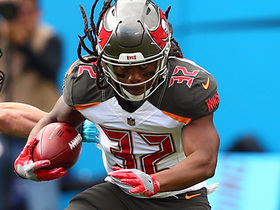 Tampa Bay Buccaneers running back Jacquizz Rodgers rushes for 15 yards and a first down. 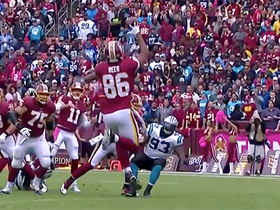 Watch as Washington Redskins tight end Jordan Reed makes a remarkable one-handed catch. 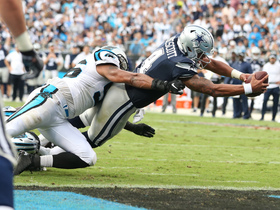 Carolina Panthers defensive end Mario Addison chases down Dallas Cowboys quarterback Dak Prescott and knocks the ball loose, allowing cornerback Captain Munnerlyn to recover the ball. Dallas Cowboys quarterback Dak Prescott avoids a sack and throws on the run to wide receiver Deonte Thompson for 13 yards. 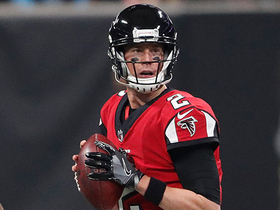 Atlanta Falcons quarterback Matt Ryan feels the pressure and steps up and throws on the run to Julio Jones for 15 yards. 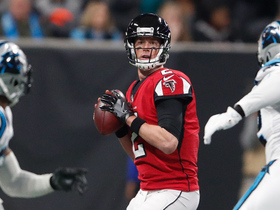 Atlanta Falcons quarterback Matt Ryan rifles a pass to wide receiver Mohamed Sanu for 18 yards to keep the drive alive. 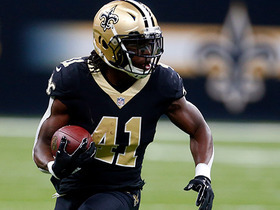 New Orleans Saints running back Alvin Kamara runs for 17 yards. 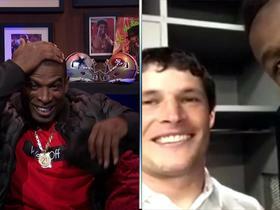 Carolina Panthers linebacker Luke Kuechly catches up with NFL Media's Deion Sanders.